The Goring - Belgravia and Westminster’s other House of Lords. Within a royal whisker of Buckingham Palace Gardens. 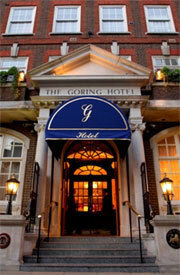 The Goring is London’s only privately owned 5-star. This splendid property is situated in the affluent and much sought-after Belgravia district – one of the most exclusive and expensive districts in the world. The district takes its name from one of the Duke of Westminster's ancillary titles, Viscount Belgrave. Visitors to London’s cultural and economic quarter will find the Goring just south of Buckingham Palace making it one of the most quintessentially English lodgings in the capital. This grand establishment with its history dating back to the early 1900s was the world’s first hotel with en suite facilities and it continues to push the boundaries where luxuries are concerned.